A JAG using the Web-based Judge Advocate Distance Education courseware begins the lesson at an opening page such as this one. Unlike a civilian lawyer with a practice focusing on a single area, judge advocates of the Air Force often must deal with a variety of legal areas every day. Adding to the challenge is that members of the Air Force Judge Advocate General's Corps, as well as their paralegal and civilian colleagues, do not work in a law-firmlike environment of legal experts and law libraries. "We have 1,300 JAGs, and they are scattered literally all over the world," said Maj. Bruce Barnard, Air Force program manager for the Advanced Distributed Learning program. The service created the program to develop common standards, tools and coursework for the Defense Department. The JAG Corps challenges created the need for a distance learning solution that not only quickly delivered courseware but that also helped develop those courses. To meet this need, the JAG Corps installed the e-learning system knowledgeWorks from techniques.org of Wheat Ridge, Colo. Instead of developing and delivering courses that last for days, the JAG Corps is using knowledgeWorks to create short training modules lasting an average of 25 to 50 minutes. Short training modules better meet the real-world needs of JAGs, Barnard said. "When you have someone who has the need for real-time training on a specific topic, and that person is sitting in 'Wherever-istan,' it had been very difficult for us to get them the training they need in real time," Barnard said. For example, a JAG in Iraq may need a refresher course on laws and rules relating to contingency contracting. The old method was to develop training materials, publish them on paper or CD-ROM and ship it to the JAG who needed it. The method was slow and made it difficult to update courseware and track who had been trained. A Web-based, e-learning solution solves those problems. If the learning module already has been written, the JAG can get the needed training in a matter of hours instead of weeks. The flexibility of hosting course modules in a central location and making them available on the Air Force's Judge Advocate Distance Education portal makes the e-learning solution valuable for on-the-go JAGs, said Ryan Gilmer, founder and director of client services for techniques.org. "One minute, they may be in Denver, the next week in Louisiana, and the week after that they may find themselves in Iraq," Gilmer said. "Now they can continue doing the training all the way through those locations." The IT staff with the Air Force Legal Services Agency at Maxwell Air Force Base in Montgomery, Ala., did the systems integration work to run knowledgeWorks on JADE, Barnard said. KnowledgeWorks leverages capabilities of Java 2 Platform Enterprise Edition application servers, so its integration is scalable and flexible, Gilmer said. It also can be deployed on a department-level server for just a few learners. For Defense Department applications, knowledgeWorks is certified by the Pentagon's Advanced Distributed Learning initiative and complies with the Sharable Content Object Reference Model standard. Having the infrastructure to quickly develop a 25- to 50-minute module is one of the biggest benefits of the system, Barnard said. It is less than a week from "the time we define the need to the time that we've got something up on JADE," Barnard said. "If you contracted this out, it could take a year to get a course online." Much of the time saved derives from a change in the length of courses, which usually were broad and were a week or two long. Short modules better fit the needs of people in the field and can be developed quicker. Modules on topics such as medical malpractice and rules of evidence are being developed, he said. As they are completed, they are available on JADE for whenever JAGs need them. The feature is of value to fire departments in staying abreast of new standards published by the National Fire Protection Association. With an e-learning solution such as knowledgeWorks, the courseware is updated in a central location, from which it can be sent to those who need it. "You log on in the morning, and a notice comes up that you need to take this five-minute course," Gilmer said. "You're graded on it, and the system automatically reports back to the human resources department that you passed this module." The on-demand aspect of e-learning is also valuable to government agencies with staff all over the globe, Gilmer said. For JAGs stationed in Afghanistan and Iraq, the time difference makes getting live support difficult. Rather than wait for someone stateside to e-mail a worksheet or checklist, the JAG can find the documents in the training module, Barnard said. E-learning will not replace live classes, but it reduces the need for them, which saves money. Flying 55 JAGs to Montgomery, Ala., for a two-day course is expensive. If you have an innovative solution that you recently installed in a government agency, contact Staff Writer Doug Beizer at dbeizer@postnewsweektech.com. Provide on-demand training for JAGs stationed anywhere in the world, and create a system in which new courses can be developed and published quickly for those who need them. It took too long to burn courseware onto CD-ROMs and distribute the disks. Also, the process made updating or creating typical distance learning solutions too slow. 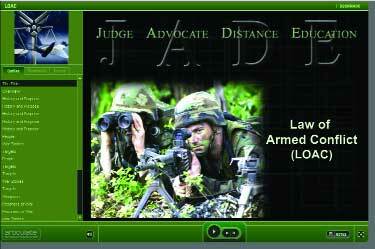 Techniques.org's e-learning software called knowledgeWorks allows for hosting of new course modules on the JAG Corps' portal Judge Advocate Distance Education. The software also tracks the progress of those undergoing training. JAGs now have on-demand access to training and materials they need. As new needs are identified, courseware can be developed and published quickly. In most cases, by eliminating the need to fly JAGs to a central location for training, the JAG Corps is saving money.